THEMIS Image of the Day, January 9, 2019. This VIS image shows a portion of Noachis Terra to the northeast of Argyre Planitia. In the middle of the image is an unnamed crater that is not even close to being round. Instead the crater has a rim that bulges out on the west side. The ejecta is still visible, so this is an impact crater, but the odd shape points to surface properties that affected the crater formation. In regions with large amount of tectonic features, the subsurface faults and structures can displace impact energy along the planes of the subsurface faults. In uniform subsurfaces the energy propagates uniformly as a spherical wave. Meteor Crater in northern Arizona is an earth example of such subsurface control – it is square rather than round. The oval form to the left of the crater may have been formed by an oblique impact – when a meteor hits the surface at a low angle. 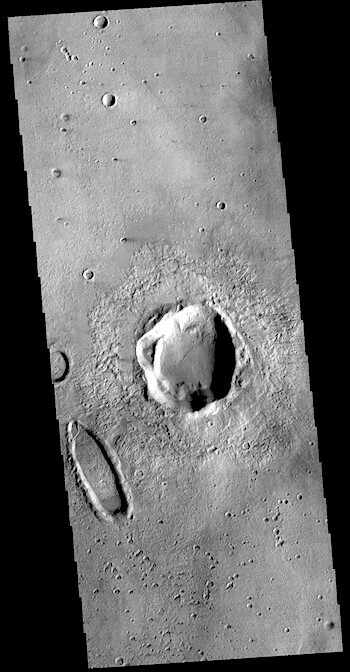 This entry was posted in Reports and tagged Arizona State University, ASU, crater ejecta, impact craters, Mars Odyssey, NASA, Noachis Terra, oblique impacts, secondary craters, THEMIS, THEMIS Image of the Day, Thermal Emission Imaging System. Bookmark the permalink.